Roger Moten joins the GIANTS AFL Women's coaching staff after being part of the Women's Winter Series. Roger, Krissie and Jon are fantastic additions to the club and they all bring a wealth of football knowledge to impart on our playing group. The GIANTS have finalised their coaching staff for the 2019 NAB AFL Women’s season. Roger Moten, Krissie Steen and Jon Vlatko join the GIANTS as assistant coaches to Alan McConnell, who is entering his second year at the helm of the GIANTS’ AFLW team. Moten joins as Backline Coach and is familiar with the GIANTS’ AFLW program, having coached the Northern GIANTS in the recent Women’s Winter Series. 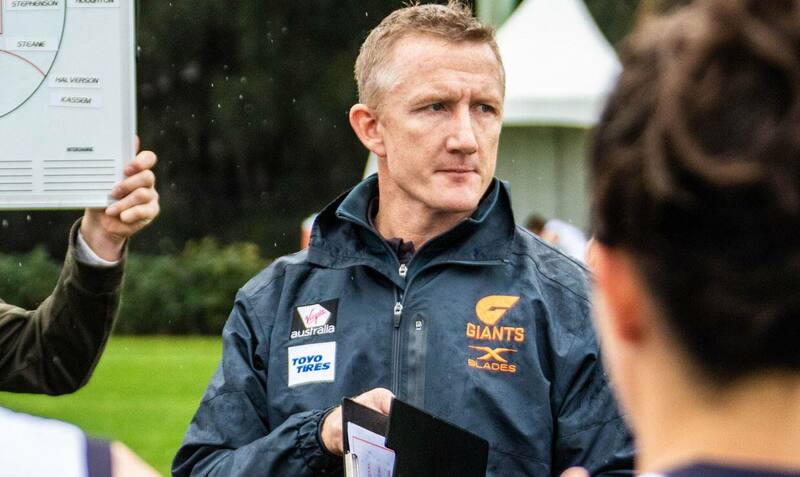 A development coach with the GIANTS’ men’s program from 2016-2017, Moten has also been an assistant coach for the GIANTS at NEAFL level after a successful coaching career with Sydney University. As a player/coach of UTS, Moten won two first grade premierships before taking over at Sydney University where he was named AFL Sydney’s Coach of the Year in 2010 and coached the Students in their first NEAFL year in 2012. Steen is a well-regarded coach in the SANFLW competition having guided South Adelaide to the 2018 premiership following premiership success at SAWFL side Adelaide University in 2017 and joins the GIANTS as Midfield Coach. Steen was involved with the Western Bulldogs’ women’s team during the 2014 and 2015 exhibition games and is familiar with the GIANTS setup having held a position as a performance analyst from 2013-2014. A Sydney local, Steen has worked her way up the ranks having coached the UTS Shamrocks, Sydney University, UNSW-ES Bulldogs and the NSW Under-18s Youth Girls team. Vlatko spent the 2018 AFLW season as the club’s runner and acted as Assistant Coach to Moten during the Women’s Winter Series. Vlatko is a four-time premiership player with AFL Sydney side, the East Coast Eagles. A life member of the Eagles, Vlatko captained the club, played over 200 games and for the past two seasons acted as Midfield Coach. Previously an assistant coach at the NSW Women’s Academy, Vlatko will look to use his experience as the GIANTS’ Forwards Coach in 2019. McConnell welcomed the trio to his new-look coaching set-up ahead of the return of the AFLW program in late November. “Roger, Krissie and Jon are fantastic additions to the club and they all bring a wealth of football knowledge to impart on our playing group,” McConnell said. “Roger knows the playing group well, having coached a number of our squad during the Winter Series, and it’s exciting to have him return to the club in another capacity. “Krissie’s experience speaks for itself, she’s had a lot of success in her coaching career and comes off the back of winning a SANFLW premiership with South Adelaide. GIANTS veterans Heath Shaw and Brett Deledio will continue their coaching development by supporting the AFLW coaching staff throughout the 2019 season. Shaw featured heavily throughout the 2018 AFLW season, mentoring the backline and coaching from the bench on match days. The GIANTS would like to thank outgoing assistant coaches Adrian Pavese, Tracey Kick and Marc Dragicevic for their contribution to the club. The GIANTS’ AFLW team commence their pre-season training on November 17 ahead of the 2019 season, with the full fixture released last week. Click here to see the full fixture. Everything’s bigger up close. Don’t miss a minute of the action live, become a 2019 GIANTS AFL Women’s supporter member. Sign up today at membership.gwsgiants.com.au or call 1300 442 687.